Praz-Delavallade is pleased to announce their third solo-exhibition by Los Angeles based artist Sam Durant. Through his drawings, sculptures and installations, Sam Durant explores the realms of pop culture, history and memorialization in order to question the values of American society. After having focused on such pivotal periods as the civil-rights era, the 1968 student riots, and the last century’s struggle between Native Americans and European settlers, economics have taken a determinant place in his more recent series. The title of the show refers to American artist Robert Smithson’s work Yucatan Mirror Displacements (1969) which was was itself a reference to writer John Lloyd Stephen’s book Incidents of Travel in Yucatan (1843). At the forefront in all of his work, the mirror interests Sam Durant because of its potent symbolic charge. Evocative of both reflection and reflexion, a mirror suggests the creation of a perspective leading to an infinite number of interpretations. The viewer finds himself involved in the work, both through the reflected image and his own reflexion process. These references to "mirror travels" are then mapped onto particularly nihilistic examples of street graffiti. 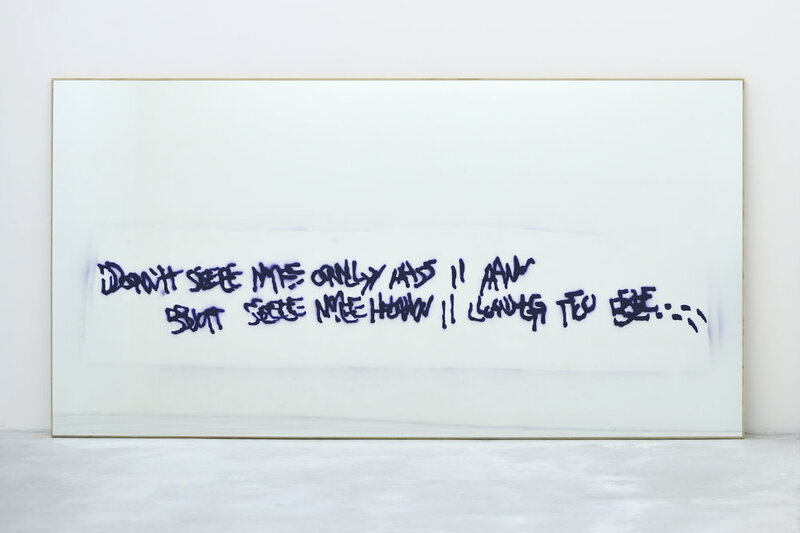 Each work consists of the reproduction of a graffiti slogan stenciled onto a mirror. Although the slogans are from multiple locations and different years they can be understood as responses to the effects of neoliberalism’s global hegemony. Beginning on a global scale in the late 1970’s by the governments of Ronald Reagan in the US, Margaret Thatcher in the UK and Deng Xiaoping in China, neoliberalism was created primarily by conservative economists based at the University of Chicago. It has since been adopted or imposed as the global economic system through institutions like the World Bank, The International Monetary Fund and the World Trade Organization. Through his work, Sam Durant addresses what he considers neoliberal economic policy’s main achievement: the restoration of class power to the world’s elites along with the largest upward transfer of wealth in modern history. What has happened to the other 99% percent of the population whose standard of living has been in corresponding decline has not been of much concern to those championing the free market fundamentalism. These mirror works are meant as “signs” from the other 99%.